"I don't care too much for the money," crooned the Beatles in their 1964 hit song, "for money can't buy me love." 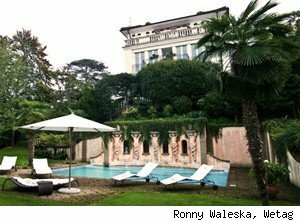 What it can buy you though, is Beatles lead guitarist George Harrison's sprawling, stately mansion in prestigious Montagnola, Switzerland. Exactly how much money though, we're not entirely sure. The listing agents at Christie's International affiliate Wetag are keeping mum about how much the late Beatle's digs are going for. But we're assuming a ballpark figure of a whole lot (apparently, Harrison had purchased the estate for $10 million, back in 2001) because it's out of this world. 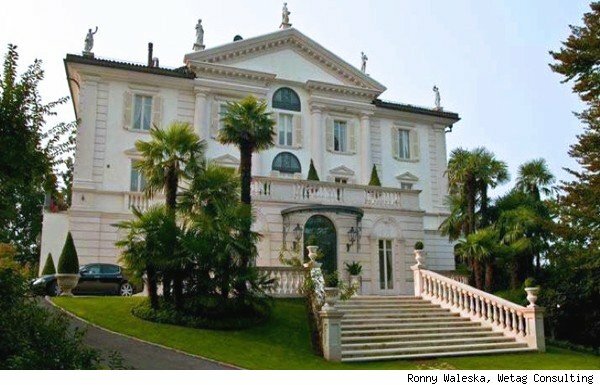 The castle-like structure has views of scenic Lake Lugano, the Swiss Alps and Monte Rosa. The 10,800-square-foot main house boasts classic Palladian architecture and impeccable European craftsmanship. Unique mosaics adorn the marble floors, flown in especially from Hungary, France and Italy. The entire home is tastefully adorned with frescoes, columns, marble fireplaces and boiserie paneling. Standout features include a massive wine cellar, a four-story elevator and a Roman-style swimming pool embellished with fountains and exquisite statues. Home aside, the 1.6 acre parkland that Harrison's manor is built upon is remarkable in itself. 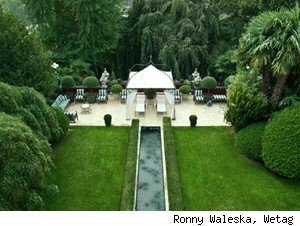 At the summit of Montagnola, the park is abundant with formal gardens filled with bonsai trees, palms and other mature trees, topiaries and fountains. An 1,800-square-foot outbuilding bordering the village of Montagnola can act as staff quarters or a guesthouse. As if that weren't quite enough, the Harrison estate also features a "charming miniature brick castle" spanning 800 square feet, a hidden treehouse and a tree swing. Too fancy for your tastes? That's OK -- you can find Beatles real estate a little closer to home, and a bit more affordable. Beatles drummer Ringo Starr is still selling his Aspen, Colo. ranch, which is a touch cozier than Harrison's luxurious Swiss manse. The charming, three-bedroom riverside ranch is going for a (we're assuming) comparatively cheaper $4.5 million. The home isn't publicly listed but is still available for inspection "by word of mouth to qualified buyers." Harrison's Montagnola home was reportedly his "last permanent residence" before his death in 2001 at 58 years old. Follow Krisanne Alcantara on Twitter (@krisannetraz), follow @AOLRealEstate, or connect with AOL Real Estate on Facebook.